You are here: Home / Blog / Green Cleaning Products / What Does the DfE Label Mean? When searching for green janitorial supplies, green cleaning products, or just a way to ensure natural green home cleaning strategies, it is hard to select from all of the products available. There are so many different claims and as a consumer it is hard to know where to turn, especially with the prevalence of greenwashing (check out our free ebook!) One quickly becomes overwhelmed. Fortunately there are reputable third party certifications available to help you. As a result of the stringent third party reviews and certifications, you can be confident that the products with these certifications have received a comprehensive and rigorous evaluation so you know your cleaners are safe, nontoxic, and effective. Only after earning the certification can the products legally display the logo on their product label. Good news, Green Cleaning Products LLC specializes in offering products that have one or more of these certifications! So what does the Design for the Environment label mean? The short answer is that you can be confident that the products: Do not harm the environment, Is safe and nontoxic to humans and pets, and most importantly they work! The Design for the Environment (DfE) Safer Chemistry program by the US Environmental Protection Agency (EPA) is a voluntary program for the formulators and manufacturers to earn when they are committed specifically to helping you, the consumer and industrial or commercial users, in selecting safer green cleaning products that do not sacrifice quality or performance. Partnering with the scientific community, green chemistry is used to substitute the toxic chemicals that have been used for decades. In securing the certification from the US EPA, the DfE Safer Chemistry program provides an in-depth comparison of potential human health and environmental impacts of the chemicals used which goes beyond traditional product development. All evaluations under this program are fully transparent with high standards in evaluating the human health and environmental concerns associated with the alternative chemicals. The DfE certification must be reviewed and approved every three years. This brings the manufacturer back to the US EPA to re-submit their product again. The process is graduated as the manufacturer must make at least one ingredient change from the previous formulation that is for the better before they will be granted the DfE certification again. New green cleaning products, however, are based on bio science mimicking nature with green chemistry from the ground up instead of using synthetic compounds derived from toxic substances. As a result the newest green cleaning products and green janitorial supplies become the benchmark for the future since they must actually achieve a standard higher than one that was certified previously. Mainstream companies like Proctor and Gamble, The Clorox Company, S.C. Johnson & Son, Inc. and others work for years in this graduated method by changing only one toxic, synthetic chemical at a time. In conclusion if a product displays the Design for the Environment (DfE) label on household and commercial products, such as all-purpose cleaners, glass cleaners, and carpet care products, you, the consumer or industrial procurement officer, can be confident that the product has met stringent criteria for human and environmental health and is truly green. 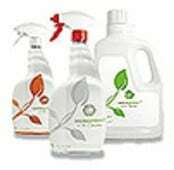 Look for the DfE or Design for the Environment logo, as is displayed on the green cleaning products, whenever you shop or procure your green cleaning products and janitorial supplies. Join this national effort to protect human and environmental health.